Holy Matrimony is Christian marriage, in which two persons enter into a life‑long union, make their vows before God and the Church, and receive the grace and blessing of God to help them fulfill their vows (BCP, p. 861). Marriage according to the Book of Common Prayer is "intended by God for [the couple's] mutual joy; for the help and comfort given one another in prosperity and adversity; and, when it is God's will, for the procreation of children and their nurture in the knowledge and love of the Lord. Therefore marriage is not to be entered into unadvisedly or lightly, but reverently, deliberately, and in accordance with the purposes for which it was instituted by God" (BCP, p. 423). 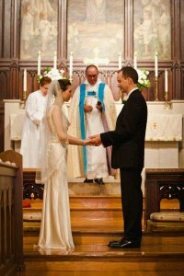 Every couple is asked to take the holiness of matrimony seriously and reflect prayerfully upon the purposes of marriage stated above from the Book of Common Prayer. The wedding ceremony and preparation will be carried out in accordance with the Canon of the Episcopal Church and of the Diocese of Long Island and with the law of the State of New York. Who may get married at St. John's? One of the couple is a regular member of the parish in good standing or has an immediate family connection (parent or grandparent) with a parish member in good standing. Or if one of the couple is a member in good standing of another Episcopal Church, a communication and understanding from the Rector of that church must be given to the Rector of St. John's. What if I am not a member of St. John's or another Episcopal Church? One of the couple must be a baptized Christian and submit a proof of Baptism to the parish office at the time of application. The couple is asked to attend the worship service at St. John's and is encouraged to join the parish before they begin the marriage preparation with the officiating priest. Your First Step, if you wish to be married at St. John's, is to attend a worship service on Sunday and introduce yourselves to the Rector. What if I was previously married? Permission from the Bishop of the Diocese of Long Island must be sought. A copy of the Certificate of Divorce or a copy of the Death Certificate of the deceased spouse from the previous marriage must be submitted to the priest at the first meeting, and another meeting with the Rector would be needed before an application for remarriage is sent to the Bishop and before the proper marriage preparation can begin. Who may officiate at weddings at St. John's? It is generally expected that the priest of St. John's is to officiate at all weddings. the wedding ceremony will be done in accordance with the usual liturgical customary of St. John's. the visiting clergy may be asked to read a scripture lesson, give a brief and sensible homily, offer a prayer for the couple, bless the couple with the Rector, or may be invited to concelebrate in the Eucharist. What is involved in the marriage preparation? In accordance with the Canon of the Episcopal Church and of the Diocese of Long Island, the couple will take part in a marriage preparation with the clergy in several meetings (usually 3-4). The discussion involves family of origin, areas of conflict, faith and spiritual issues, personal finances, intimacy, and other important relationship issues. The couple will be asked to take part in a day retreat with other couples. How can we set the date? 1. Given the preparation involved, a minimum of six months notice is usually needed to book a Wedding Date. 2. Weddings will not be scheduled during the season of Lent and Holy Week. 3. Weddings can not be scheduled on the day of St. John's Annual Harvest Fair Day, which is traditionally the first Saturday of November. 4. Weddings can not be booked on the same day as another Wedding here at St. John's. 5. Weddings can not have a start time later than 5:00 pm. 6. A completed Marriage Application and a deposit of $300 must be submitted to the Church Office in order to book a wedding date. 7. If the wedding is cancelled after the 3-4 preparation meetings with the clergy, the deposit is non-refundable. What kind of service will it be? 1. The couple will be supplied with the Order of Service for a Marriage from the Book of Common Prayer. 2. This Order of Service will be reviewed in the meetings with the officiating minister. 3. The wording of Vows cannot be changed. 4. The couple has the choice of the readings, and who will read them, the music (Hymns, Processional, Recessional) and soloists and other details relating to the service. 5. The couple is responsible for the creation and production of their Wedding Service Program for their wedding guests. 6. The couple must show a draft of their Wedding Service Program at least one month prior to Wedding date for clergy approval. Is there a wedding rehearsal? The wedding rehearsal usually takes place the evening before the ceremony. The purpose of the rehearsal is for those involved in the ceremony "walk through" the service so that they feel comfortable with the setting and the ceremony. This is an important part of the wedding preparation, for it provides the opportunity to answer any questions about the service itself and iron out any other details. It is important that everyone who has a part in the service be present for the rehearsal. The couple will need to obtain a Marriage License prior to their wedding. Marriage Licenses should be given to the clergy at the time of the wedding rehearsal. Weddings can not go forward unless the clergy has the Marriage License before the service. How can I arrange music for the wedding? 1. The couple must contact the Organist to discuss their music selections. 2. A Soloist from St. John's can be arranged (depending on availability), if so desired. There will be an additional fee incurred. 3. If the couple has a soloist of their own that they wish to sing at their wedding, the approval of the Rector will be required. 4. A separate music rehearsal with the couple's soloist and the organist will need to be scheduled, with an additional Organist fee incurred. 5. Pre-taped music is discouraged. 6. A list of suggested wedding music selections, as per the Organist, can be found at the end of these Guidelines and Checklist. 7. St. John's does not provide a choir for weddings. 8. St. John's Church bell is not available to be rung at weddings, however if requested in advance, the organist can play the organ's carillon bells. What about flower arrangements and decorations? 1. Flowers are the responsibility of the couple. Tasteful floral arrangements may be placed above the high altar. 2. Floral arrangements may be placed at the foot of the Choir screen. 3. All floral arrangements must be tasteful, unobtrusive and not larger than 4 feet in height. 4. All floral arrangements must conform to the space available. 5. Trees and any other such fauna, and d?cor, are not permitted. 6. We do not supply Pew Bows. Your florist may provide them, or you may bring pew bows you have made. 7. Unity candles and congregational hand held candles are not permitted. 8. Aisle runners, of any kind, are not permitted. Please advise the limo driver of this in advance. 9. Flower girls are permitted to toss flower petals down the center aisle in advance of the bride. 10.Relocation, or removal, of church's interior furniture is not permitted. 11.Aisle candles are available for an additional fee. 12.The couple is asked to contact the chair of the Altar Guild, Audrey Homan, to discuss decorations and flower arrangements and their delivery to church. What are the rules for photography, video and other equipment? 1. Photography inside the church must respect and honor the reverence of the wedding covenant. 2. One professional photographer (along with one assistant) will be permitted to take photographs during the service. 3. There shall be no flash photography during the service. 4. If the wedding includes Holy Communion, photography is not permitted during that part of the service. 5. Stationary video camera and equipment will be permitted to be set up on a tri-pod or stand and placed in a designated area to record the wedding service. 6. There shall be no roaming video cameras during the wedding service. Other Church etiquettes and issues? 1. Rice and confetti are not permitted to be tossed on church grounds. 2. Birdseed and flower petals can be tossed. 3. Bubbles may be blown, miniature bells can be rung; celebration wands may be waved as other alternatives. 4. St. John's does not have any on-site parking. Your guests can park along Prospect Street (where permitted), along Main Street (meter parking), or in one of the two General Parking lots - located on Gerard Street (north parallel to Main Street) or on Green Street (east adjacent to Prospect Street). 5. The consumption of alcohol on church grounds and/or sidewalk prior to, or immediately following the wedding, is not permitted. 6. The wedding party should be clothed in attire that is decent and reverent to the setting of the church. In many parts of the world it is not unusual for the couple to be married in a civil ceremony and then come to the church for the blessing of their marriage. The same principle and understanding of the Christian marriage and the Canon law will apply to the Blessing of a Civil Marriage.